Bringing some Germans to Bohemian House seemed like a good idea to gauge the Czech, Austrian and German inspired food. The first thing you notice about BoHo is the homey decor that mixes equal parts rustic and elegance. Lively (bordering on loud), attentive service and comfortable atmosphere give you the feeling you were invited to a really big dinner party. 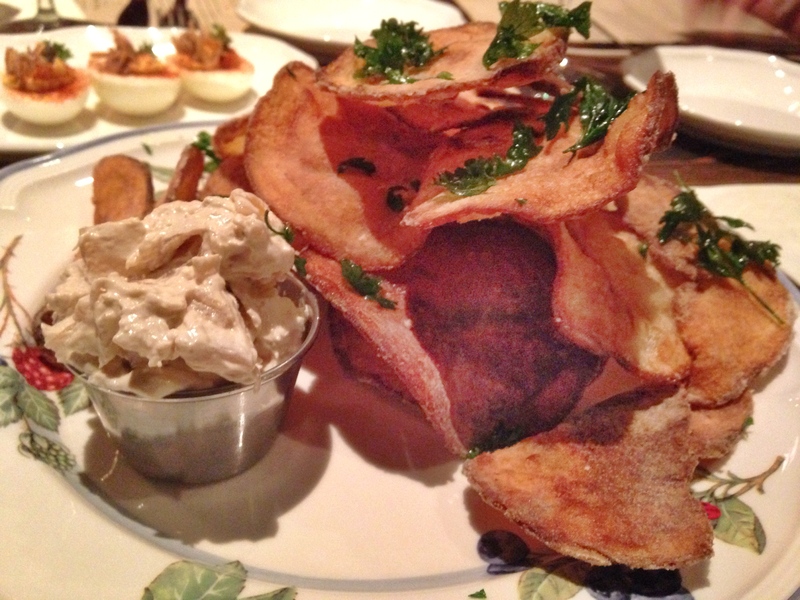 My favorite small plate was the salt & vinegar chips served with horseradish-onion dip. Silver dollar pancakes sized chips with a nice crunch, zing of vinegar and topped off with crispy parsley. The deviled eggs were pretty to look at and the beef pierogi were the fanciest presentation I have seen in a while. Deviled eggs with smoked whitefish, fried capers & crispy shallots. Beef pierogies with roasted carrots, sour cream & pickled shallots. The pork schnitzel served with German potato salad, dill sauce and charred lemon was received well. I asked if there was any difference and they noted that schnitzel in Germany is served thinner but they liked the “Chicago take.” The grilled chicken paprikash is a generous portion with an interesting mix of flavors and textures with pickeled sweet peppers, braised kale and Czhech potato dumplings. 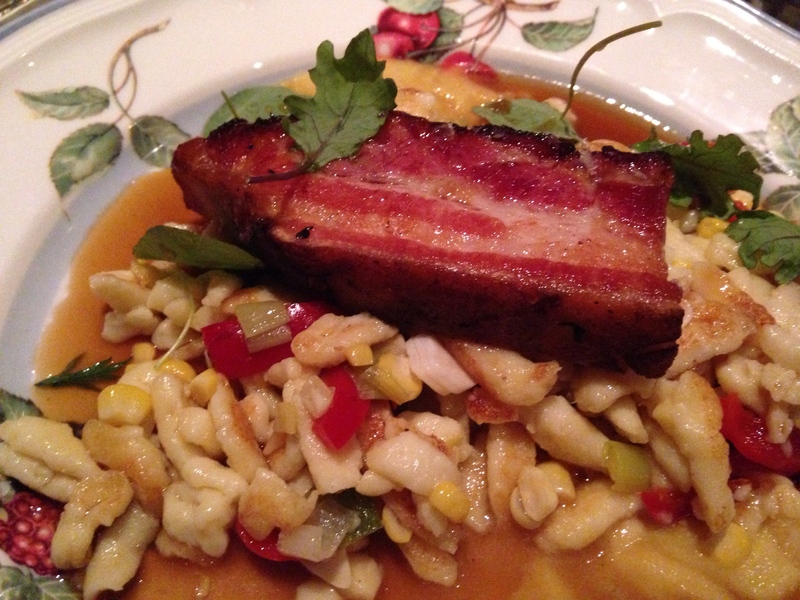 I ordered the Spätzle with pork belly, smoked corn, leeks and peppers. For what could be a heavy dish this was surprisingly light, not counting the pork belly, I’ll get to that in a moment. Our server poured some pork broth over everything and I got to work. The corn provided a nice crunch to accompany the soft and light spätzle. The peppers were pickled and added a nice acidic note to the richness of the sauce and a visual punch of red. The Germans were a bit aghast at the pork belly and its size. I let them know this was how we do it in Chicago. 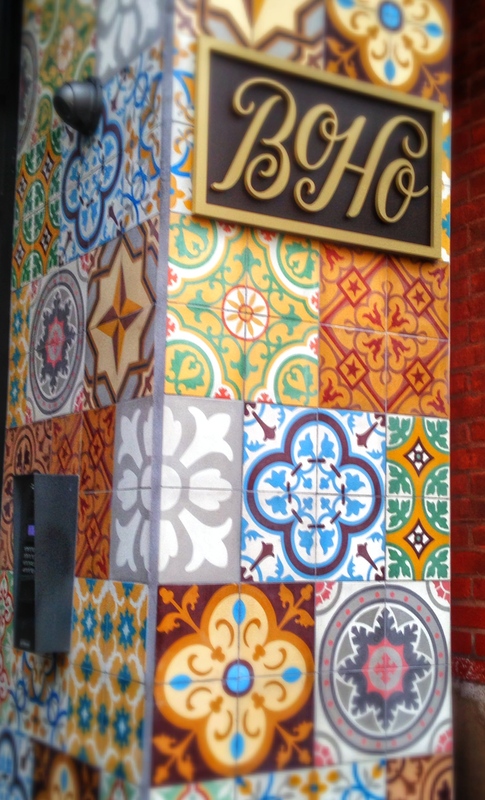 BoHo offers a good selection of Czech and German beers to wash down the food. 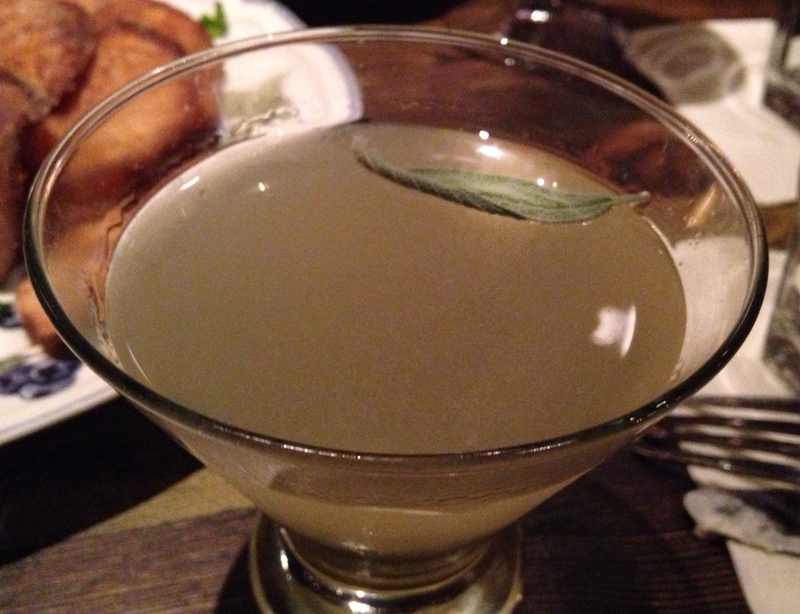 The Bohemian Bee is a good cocktail for gin lovers, served with honey, lemon and a sage leaf. Every sip provided an extra sensory experience with a whiff of sage from the delicate leaf floating in the glass. There isn’t much variety in dinner options in River North and the Bohemian House offers a nice break from norm with its Midwest take on Eastern European food. It’s also a great place to have a drink, nibble on small plates and relax in a beautiful room.